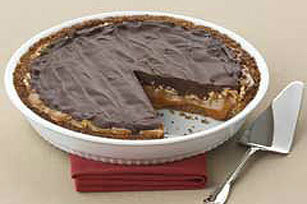 For the ultimate dessert, serve this decadent chilled pie of caramel, pecans and chocolate layered in a pecan crust. It’s perfect for any event. Use pulsing action to blend 2 cups nuts in blender until finely ground. Mix with granulated sugar and butter; press onto bottom and up side of 9-inch pie plate. Bake 12 to 15 min. or until lightly browned. (If crust puffs up during baking, gently press down with back of spoon.) Cool completely. Cook chocolate, remaining cream, powdered sugar and vanilla in saucepan on low heat just until chocolate is completely melted and mixture is well blended, stirring constantly. Pour over pie; spread to cover top of pie. Refrigerate 2 hours. Serve this decadent pie at your next annual holiday celebration. Follow the serving size and enjoy each bite of this once-a-year treat! Prepare using a 6-oz. ready-to-use graham cracker crumb crust.